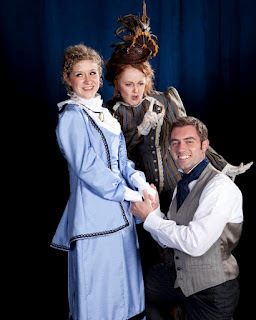 Two weeks ago I had the privilege of watching my amazingly talented actress friend, Megan Smyth, perform the role of Gwendolen in The Importance of Being Earnest at Centerpoint Legacy Theater in Centerville, Utah. She had shared with me many of her moments of worry and moments of glory, so I actually spent most of the play trying to observe her so I could give her feedback. Thank heavens everyone was so delightful that nothing really stood out to me as a detraction from anyone's performance. I giggled a little as some of the actors slid out of their accents or made a modern gesture, but those occurrences were far and few between. The men were handsome. Jack, as played by Jon Rash, in particular. I love when a theater is able to find a handsome leading man and let's just say I really loved this theater's choice. Allyson Sanders, the young lady playing Cecily, is just a gem. She is delightful and sparklingly beautiful in every way. Allyson filled the stage with every nuance of her character utterly convincingly. Not only were these performers talented, but you really wanted to watch them. I'm sorry, but aesthetics is a part of theater. You did a fantastic job! You were just quirky enough that that cleaarrrrrly came across in the character but did not leave us at all wondering why Jack/Jon/Earnest would want to be with you. Make sense? Did I think it weird that no one kissed kissed? If only one couple had kissed, I would have thought it weird, but since both did cheeks, I thought it was period and I actually think it simplified matters. Although marriage is being discussed, the comedy is so light-hearted that kissing almost seems too serious and romantic. I think all the proper sentiments were displayed with the longing looks, the dialogue, and the cheek-kisses." Megan has this arsenal of dynamic facial expressions to convey layers in her characters. She is one of the sweetest, kindest, most wholesome young ladies I've ever met, but she delivered one scandalous line with such finesse, she had me utterly convinced she was out to seduce Earnest. Thinking back on it, I start to giggle all over again. Let it be known, the genre of The Importance of Being Earnest is not my forte nor my preference. However, this production is highly enjoyable, even for me! This was my first time seeing it live and I would very much recommend you go see this one, especially if you love Oscar Wilde. They do him proud. Megan's cast (Go see this one! Go see this one!) is T/Th/S and plays until April 28. You can, should, and will buy tickets here. They've been selling out, so buy in advance! Great review, and now I wish even more that I could go see it! Oh, I love this so much, Larissa! Thank you so much for coming and for your thoughtful, generous words. You are simply too good to me! I love you!